Goliath, perhaps the most famous Shire Horse that ever lived died today the 20th July 2001. A huge black horse of immense character, he travelled the Country for ten years as the senior members of Young and Co's Brewery, team of show horses. During this time he was found to be the tallest horse in Great Britain and in fact featured in the famous Guinness Book of Records for over eight years. Goliath did not have an easy life and because of his size he was mistakenly put to work at the age of two. For this, the horse had to pay a high price in his old age and suffered from arthritis and rheumatism in his joints. In 1981 he found favour with another remarkable character, Harry Ranson, who was for many years the head Horseman at Young's in Wandsworth. Harry "found" Goliath very down on his luck. The horse was still only four years old and in very poor condition but some sparkle was still there and Harry took a gamble by introducing Goliath into the world famous team of black shire horses. This gamble paid off and Goliath dazzled the crowds wherever he went. Goliath was six feet five inches tall to his shoulder and although he had his cantankerous moments, a more placid and gentle giant never lived. 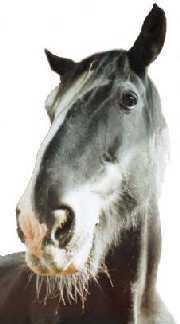 The average weight of a Shire horse today is about 16 to 17 cwt. Goliath was one of those exceptions, the One Ton plus Shire horse. Although his four white feet gave him the necessary credentials to join the Youngs team, because of his difficult early year his conformation was far from perfect. He made up for this with his outstanding character and amazing memory. Goliaths last years have been at the Northcote Heavy Horse Sanctuary, Nr Spilsby in Lincolnshire where they care for horses with big problems! When he began falling over in 1992 his original retirement home in Sussex found it too much of a problem and Goliath went north. The falling down problem was something he often brought on himself and frequently happened when he was minding someone elses business! It did not affect his general health; it was just that his back legs had lost their bendiness! The centre is operated by volunteers and funded by public subscription and one of the stalwart supporters, Andy Oughton from County Durham built a special crane to cope with Goliath's problem. While in Lincolnshire he brought joy and happiness to thousands of visitors; particularly those in wheelchairs. We earnestly believe he honestly thought those unfortunate folk were in a similar situation to himself. Goliath had the same veterinary surgeon all the time he lived in Lincolnshire. He never ceased to amaze Julian and his careers with his resilience and fortitude, his stamina and resolve. Through the Northcote Centre, Goliath has hundreds of "adopted family" throughout Britain and even in Spain and France. Goliaths year of adulation occurred in 2000 when the Guinness World Records people realised he was still alive and after six month's research found him to be the TALLEST LIVING HORSE IN THE WHOLE WORLD. He appeared in numerous national and international publications and many television programs. Goliath was not one of those very pretty horses that grace the show rings and add glamour to the day. He was the most down to earth, gentle, hardworking and genuine character. Truly one in a million. He will be greatly missed. Keith & Ruth Sanders, Terena Bolam and all the volunteers at the Northcote Heavy Horse Centre. The Centre was also home to Cracker, the former tallest Shire Horse in the world, find out more!